We were given the chance to see Inside Out, almost as soon as it was released, courtesy of Subway, who have teamed up with Disney Pixar to offer customers at their stores Inside Out themed Kids’ Paks. More information on these after the review…so what did we think of the film? Inside Out is destined to be THE hit of the summer. Disney Pixar has been criticised for sub-par outings in recent years, so is Inside Out a return to the Monsters Inc and Toy Story form of old? What is Inside Out about? The film tells the story of 11-year old Riley from inside her head. Yes; I know that sounds a little cooky, but this is the same stable that had the imagination to bring us Monsters that captured kids screams, so stay with us. We learn how these emotions shape her personality and her reactions in life. The film specifically follows her emotional journey as she moves from her beloved Minnesota to the unknown, and strange city of San Francisco. We also get glimpses of others’ “Inside Out” through the course of the film; but we won’t ruin that too much for you. In our cinema, we were also treated to the wonderful short animation, Lava; which is the charming tale, told through song, of two volcanic islands looking for love (“Lava”). What did we think of Inside Out? 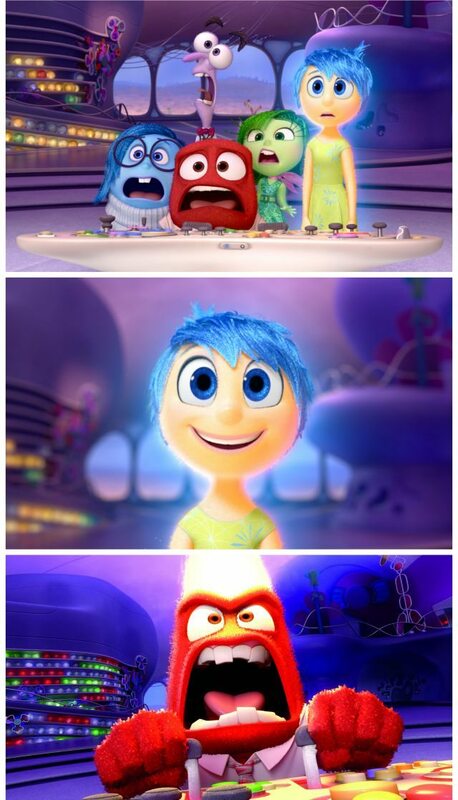 Pixar, as I am sure you know, is well known for its clever, layered stories that allow a 5, 10, 15 and 45 year old to experience different emotions during a screening, and enjoy each scene on completely different levels. Inside Out provides this in spades, with clever humour, and underlying messages that will be felt by an older child, but take nothing away from the joy the film creates in a younger child. The wonderful thing is that this film is much more subtle than some Disney outings, where their blatant “preaching” can mean that older children and adults turn off totally. There is nothing quite like being beaten about the head with a moral message for turning your stomach. Subtle is good , and much more rewarding….every…single…time. The five emotions work together in the film, and the lessons we learn about this are profound, but gentle allowing the audience to respond in their own way. If they didn’t get the message, it doesn’t matter and this helps to create a unique experience for each viewer. Inside Out is not just about those emotions though, it is also fun but not too scary, despite some of the concepts and topics the film touches upon. Toy Story 3 was too much for my delicate son; he watched this from start to finish without too much trouble. Though of course, as the film demonstrates, everyone’s emotions can react in very different ways to the same situation. The creative ideas within the film are based are very original, and exceptionally inventive too – with a central headquarters in our mind helping to build memories, and so personality, with each memory based on a trigger and dominant emotion that feeds into personality “islands”. I can’t say much more, as it will ruin the whole thing; just go watch it, and then you’ll know and you can draw your own conclusions. Be warned though, there is going to be an Inside Out 2 – of that there is no doubt….what….so….ever ;-). Yeah I know – I don’t give 10s, but I really couldn’t find ANYTHING wrong with this film; love the story, the characters, the layers, even the Disney Schmaltz has been toned down. What’s not to like about that? The film gives us all a fantastic opportunity to talk to each other about our emotions too, which is a wonderful, and important thing for all of us, and certainly a trait to be nurtured in our kids. We ALL need to talk about our feelings more, and honestly too. Riley’s idea at the end of the film was made when she was angry, so it was no surprise it was a bad idea. My daughter (9) wanted to ask who we thought everyone was; so which emotion ARE YOU? I’ll settle for that I think. Have you seen Disney Pixar’s Inside Out – what did you think to it? We were provided with tickets to see the film and a Subway meal in return for this review, but all opinions on the film are most definitely our own.